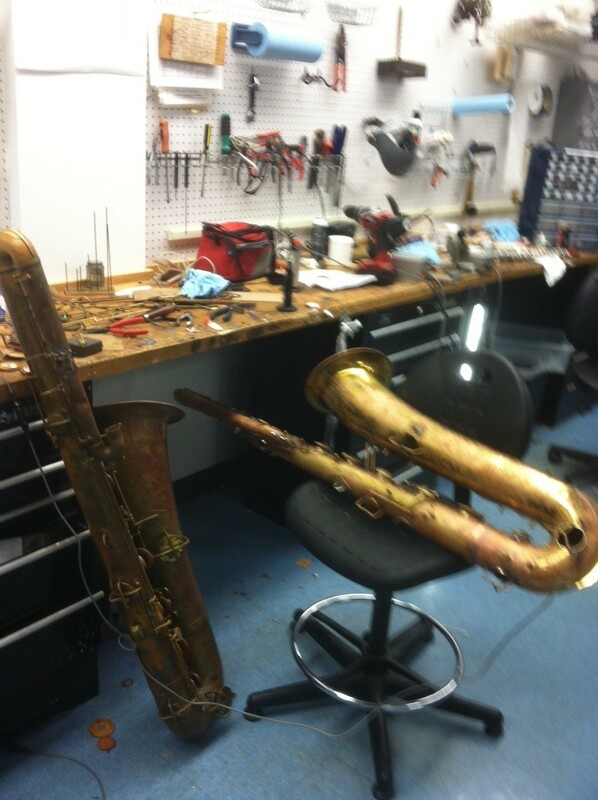 Being that I have the fortune (or misfortune depending on the day) of living and working right outside of Philadelphia, I’ve worked on more bass saxophones in a few years than most repair people will in a career. The Mummers are a big deal in Philadelphia and boy do they love their saxophones. The Mummers parade is on New Years day and is basically a bunch of men dressed up in feathers and sequins dancing down the street stone drunk. Somewhere in that mess are a few string bands, also drunk and dressed all fancy. These guys are a tad rough with their horns and the bass saxes the have are pretty much all in the century old category. So when they come into the shop, they are in really bad shape. This one (the one on the chair in the picture) has soldered tone holes. Let me tell you, this sax has been a nightmare. Pretty much every tone hole has big gaps where the soldered has crumbled away between the body and the tone hole. How the horn played a single note at this point is beyond explanation. So yesterday I was going around every tone hole and filling in all the missing solder. Today I started replacing most of the pads; the horn really needs an overhaul but the band doesn’t want to shell out the cash so I was told to ‘make it play’. Thankfully I’m doing this bass at my full time job instead of at my shop so the couple of days this work is taking me isn’t on my dime. I expect to finish the job tomorrow by lunch time and I’ll be glad to be finished with this one. So if you have a saxophone, a Martin for instance, with soldered on tone holes and you have a mysterious leak that you just can’t seem to pin down, there’s a good chance that the solder joint between the tone hole and the body has a leak somewhere. Make sure your repair checks when you bring your horn in, especially if it’s a vintage horn.